Take your renewable expert to a whole new level with a beautiful website that showcases your work. The Green Energy WordPress Theme makes it easy and affordable to create a professional online presence that will impress prospective clients and show them what you can do. 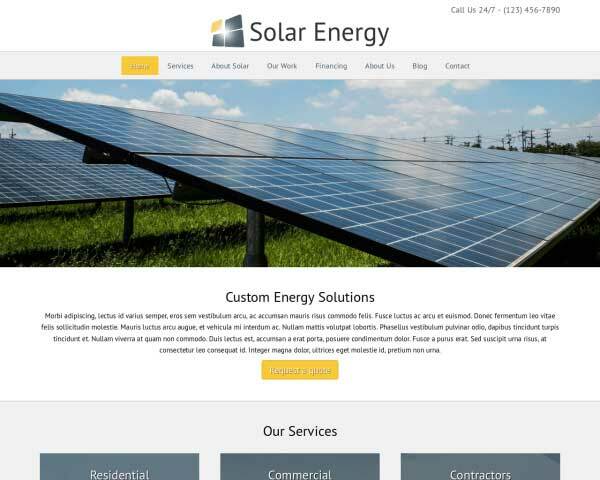 The Green Energy WordPress Theme is a full-blown content driven WP theme. It is entirely focused on the demands of renewable experts. The theme's layout and design has a distinctive professional feel to it while maintaining an intuitive navigation structure. We believe these set of features makes this Green Energy WordPress Theme the logical choice for anybody working in this industry. Your news, pictures and other articles can be incorporated with the all powerful blog features of this WordPress theme. Go into detail about each of your services on the dedicated pages set up in the Green Energy WordPress Theme. A list of links on the sidebar allows for to quick navigation to other service pages. 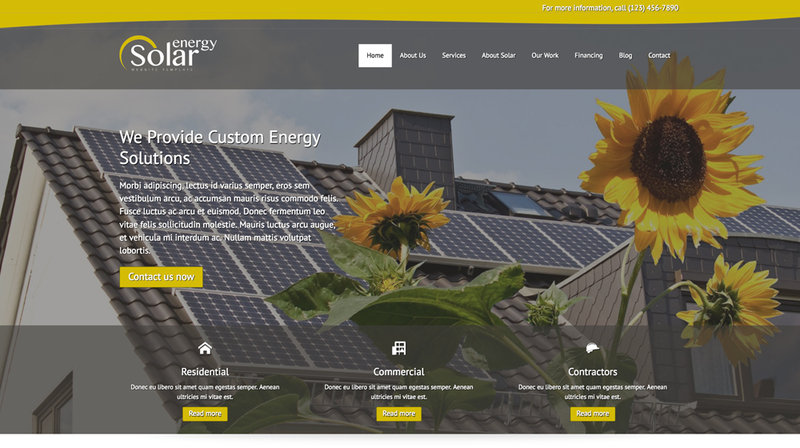 Highly visible call-to-actions on nearly every page of the Green Energy WordPress Theme encourage visitors to contact and makes it easy for them to do it! Once you've got them hooked, tell visitors how to get more info on the Green Energy WordPress Theme's Contact page. Its flexible layout can be easily customized to suit your needs. 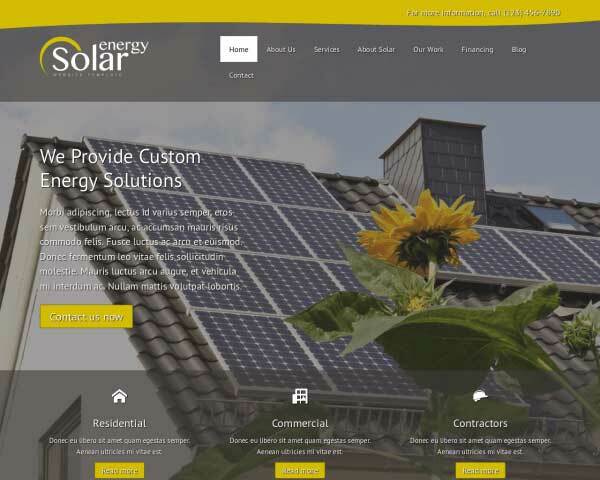 If you want to stand out from the crowd, the top-notch look-and-feel of the Green Energy WordPress Theme will prove to be the perfect solution. Add an image gallery to any page or post on this responsive WordPress theme for renewable experts. Clicking on any thumbnail opens the image in an elegant lightbox slideshow. We conducted thorough research, before developing this theme, to determine the specific business needs of renewable experts. This ensures that the theme best matches your needs. 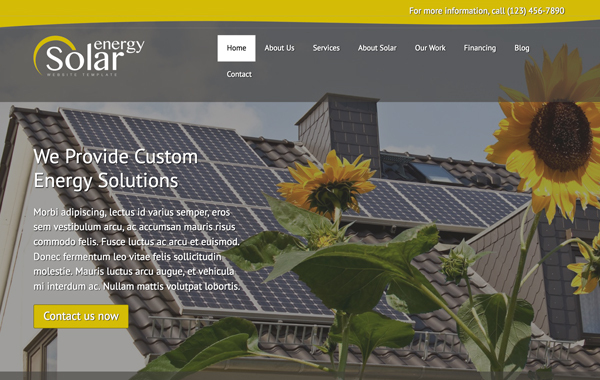 The clean layout of the Green Energy WordPress Theme let's your website's visitor know instantly what solution you can offer for their respective problems. Attractively display client feedback with the Green Energy WordPress Theme's quote widget. Just paste in your own text and the quotes will be automatically styled with no coding required. Showing customers recognizable logos from your professional associations, top brands and service awards lets them know that earning their trust is important to your business. 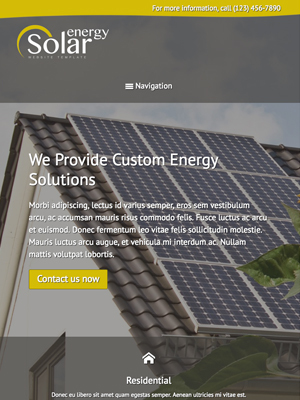 We've built the Green Energy WordPress Theme to be fully-responsive, meaning that the layout of your content will automatically adapt to accommodate visitors accessing your site from any browser or mobile device. Its mobile-friendly navigation menu allows pet owners to easily find all the pages of your site even on small screens. With no extra effort required, you can be sure that visitors will experience the same professional design and functionality of the desktop version of your website whether searching on a smartphone, iPad or anything in between.